It's been three-and-a-half years since Roger Federer won his 17th Grand Slam championship at 2012 Wimbledon. Yet the Swiss star's fire still burns brightly for more glory. "It's part of the reason why I guess I'm still playing," admitted Federer, after he reached his 12th semi-final at the Australian Open. "I feel like I'm competitive at the top. I can beat all the guys on tour. "It's nice now that in the last three Slams that I've been as consistent as I have been. I'm playing good tennis, fun tennis - for me anyway. I really enjoy being able to come to the net, more like back in the day. So I'm very pleased. It would mean a lot to me to win another title, no doubt about it." Since beating Andy Murray for the 2012 Wimbledon title, Federer has finished runner-up to Novak Djokovic in three major finals (2014-15 Wimbledon, 2015 US Open). 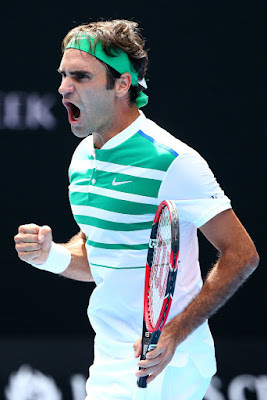 In his straight sets win over Tomas Berdych on Tuesday, Federer played aggressively, winning 24 of 29 (83 per cent) at the net and striking 48 winners. It had all the hallmarks of Stefan Edberg, his coach from 2013 to 2015, who worked side-by-side with Severin Luthi, the Swiss Davis Cup captain. Federer was speaking following 7-6 (4), 6-2, 6-4 victory against Czech sixth seed and two-time Australian Open semi-finalist Berdych at Melbourne Park. The Swiss great was a class above on Rod Laver Arena as he made it 12 wins in as many quarter-finals in Melbourne to earn a final-four showdown with Djokovic. "I think I played well overall. Wished maybe I didn't get a break here or there. At the same time Tomas was pushing for it, he was looking for it, so clearly it can happen," Federer added. "He's got a lot of power. He knows how to do it. So I was happy that on both occasions, first and third, I was able to react quickly. The second set, when I did have the break, I was able to roll with it. "I think the first set was tough. It was the one that took the longest, had the most importance of all the sets, in my opinion. It was definitely key to the rest of the match because I think it maybe might've taken some energy out of Tomas. Who knows? If not physical, also mental. It's always tough to lose the first set in best of five in a breaker in my opinion."